If you are suffering from painful heels and/or soles, but you still want to go hiking, you’re going to need grade A footwear. If you do not take this condition seriously, it will grow worse. I know how you feel, I’ve suffered from this as well. But a good pair of high end boots can truly help you fight this. Please have a look at my personal selection of boots against heel pain! Plantar fasciitis is one of the most common forms of heel pain prevalent in middle-aged men and women, and also in young people who spend a lot of time standing up, like soldiers and athletes. The condition is characterized by pain at the heel and the bottom of the foot. The condition is caused by straining your plantar fascia, the flat ligament that connects your heel bone and toes. There are various ways to go about remedying this condition and one of them involves wearing comfortable shoes designed to reduce the strain on your ligaments. Finding hiking boots for plantar fasciitis should not be a problem as there are many top quality designs that are very suitable for people with this condition. The type of footwear a person with plantar fasciitis needs, is footwear that bends a little at the toe, but that does not bend in the middle of the sole. The idea is that you have to have a sole that is rigid enough that you won’t have to strain your own plantar fascia too much. Not only does the sole need to be rigid, but the whole boot needs to be it. So when you grab a boot by the sole and the nose and you try to twist it, it should not twist a great deal. Hiking boots are inherently sturdy footwear, which makes them very suitable plantar fasciitis footwear. Timberland white ledge is definitely one of the best hiking boots for men available in the market. It comes with trademark Timberland features, like full-grain waterproof leather as well as other improvements that make it ideal for those with plantar fasciitis. The integrated BSFP support system allows you to accelerate, climb and brake effortlessly while a comfortable dual-density perforated foot bed ensures your heels are cool and dry at all times. It also features a padded collar and tongue for improved ankle protection and multidirectional lugs for more traction. Its fancy lacing system gives you a customized fit, which makes it perfect for outdoor activities. According to buyers, this boot makes it easy for your foot to settle in its natural position with every step. It has extra flex grooves and a gusseted tongue to protect you from lace pressure. It also keeps away debris from entering the shoe. What? Another white ledge? Yes, indeed! But a slightly different model! This model is another all-time great hiking boot for plantar fasciitis provided by Timberland. It contains a thick, rubber sole, which is likely to have hundreds of miles of lifespan in it. It is made of weatherproof leather with sealed seams that prevent water penetration. Like most Timberland boots, it comes with a comfortable removable foot bed (EVA) and BSFP lug sole that maintains your motion efficiency in braking, traction and acceleration. It also features a padded tongue and collar to keep your feet cool, comfortable and dry. Other features include the external heel covering for added back foot protection, the 5″ shaft and the stylish D-ring lacing system. This boot is designed for ultimate comfort and durability, as its rubber outsole can maintain motion efficiency in the worst of terrains without suffering cracks. It is made of full-grain leather which is easy to maintain and can be used in all seasons. If you love stylish boot designs, the Chocorua Trail is your best choice in the market when it comes to modern looking hiking boots. It combines full-grain weatherproof leather and latex with a synthetic sole to bring you a sturdy high-end boot at an affordable price. Other features include its sealed seams (for water resistance) and its Gore-Tex membrane. Gore-Tex always ensures good breathability, comfort and impermeability of moisture. This is helpful when, all of a sudden, rain starts pouring down during your outdoor adventures. Timberland utilizes their trademark industry standard quality, introduced all the way back in good ole’ 1973. Like other boots in the same price range, it features a good lacing system and a padded collar and tongue, which protect you from any lace pressure. The Chocorua Trail is a really great model offered by Timberland. It’s a very simplistic, yet stylish boot. Hi-Tec is another market powerhouse known for top quality efficient designs and modern technology manufacturing. The Altitude IV is made of waterproof nubuck leather, featuring sealed seams and a padded leather collar. The sole is made from carbon rubber or, as Hi-Tec calls it, multi-directional traction (MDT) rubber. Multi directional soles always work great to give you all the traction you need, wherever you set foot, and in whichever position. Other features include a soft padded, gusseted, leather tongue and a collar for increased comfort. A removable compression-molded EVA foot bed midsole ensures your hikes will remain as painless as possible, as they absorb compression and distribute the pressure evenly. It also includes a contoured sockliner from Comfort-Tec to help absorb pressure mile after mile. Its rugged, sturdy exterior suits the noble activity that is hiking really well, while soft padding ensures comfort during your undertaking of said activity. Its lace eyelids are made from rust-free brass. The Targhee II is one of the best hiking boot creations from KEEN and it features sufficient comfort and support to help you remedy plantar fasciitis. It’s made of nubuck leather and has a rubber sole with 4mm multi directional lugs, to give you balance and traction when running, walking or just plain ole’ standing around. It also features contoured locks on the heels and a hydrophobic, water-resistant mesh lining. Like other high-end models, this one comes with a midsole made of a soft comfortable EVA foot bed, for improved comfort and natural foot-settling position. Other features include a waterproof membrane and a breathable design to keep your feet dry, no matter how moist your trail may be. It is also one of the most stylish ones. You can wear them on any outdoor adventure and you can rest assured that they will make you look totally cool. Hikers looking for unique designs will find the Merrell Moab quite appealing. Not only because of its distinguishable design, but also because of its comfort and its durable features. It is made of leather and has a synthetic sole and bellows tongue. This hiking boot keeps out all the debris and water, so they can’t put a damper on your trail adventures. Other features integrated into its design, include the M select dry and M select fresh technology. These two patented technologies ensure your boot remains dry and odorless. It is sturdy and comes with a padded tongue and collar for maximum comfort levels. The ghillie lacing is also a perfect alternative to metal lace eyelids. It just makes the boot more of a friendly touch & feel. Unlike most brands, Merrel uses Vibram lugs for ultimate flexibility and traction. There are no lugs below the arch section, to ensure your feet can flex naturally, while still being supported. If you are in search of a classy premium hiking boot that incorporates durability, stability and really great style, then no design is better than that of the Salomon Quest. This model combines leather, textile and synthetic, efficiently combining all of the best properties from those materials into a single boot. It also comes with the highly reputed Salomon-4D stability. Other features include the Gore-Tex waterproof design protection and the 6.75″ shaft for hikers who need a boot that engulfes their ankles for superior stability. A protective toe cap and rugged lacing is also thrown into the mix to further complete the design. It has an updated Contragrip sole, that will give you great traction on just about any terrain you can think of. The 4D design means that its sole has 4 layers. It’s optimized to give you dynamic cushioning, so your feet will never become weary. This is another versatile model, whose design sets it apart from others. It features a synthetic sole, a 4″ shaft, meshing, and ghillie lacing. As one of the premium designs from Merrell, it comes with M select dry and M select fresh technology to keep your feet protected from moisture and odors. The air cushioning heel is designed to absorb all shocks and to distribute compression pressure evenly, for increased comfort in rugged terrains. The Vibram lug patterns offer all-condition stability and the absence of arch-bottom lugs ensure that your feet can maintain their natural flexing motions while walking. It is also worth noting that the Moab Ventilator comes with an ortholite anatomical midsole, specifically designed to help relieve heel and arch pain. Vasque Breeze offers you dry comfortable hikes on the trail and has several features to spark your interest. Its simplistic design is uniquely built with a shaft that is 6″ from the arch and 1.25″ heel for hikers that like their boots high. It is made of leather and has a synthetic sole, featuring the infamous Gore-Tex comfort linings. These thick soles are going to give you maximum heel and arch comfort. It has a nylon wicking mesh, to keep your feet dry and cool. The dual density EVA foot bed gives you cushioning, ensuring that every single step you take is going to be extremely comfortable. The exclusive Vibram contact sole, made with Vasque’s XSTrek Compound, never lets you slide, no matter what kind of harsh terrain you are subjecting your feet to. With these babies on your feet, it’s smooth sailing all day long. Thanks to its great breathability, this is one of the most highly recommended, simplistically stylish hiking boots for those with moisture-prone feet. This is another perfect option for those who like to keep their boots simple, yet sturdy. The black Timberland Flume offers incredible stability… a well known trademark of all Timberland footwear. It comes with a set of features suitable for long hikes and heel pain relief. One of the great things about this Timberland is the leather and fabric make, the rubber sole, the sealed seams, the waterproof design, the padded collar and the gusseted tongue. This boot, with its 5″ shaft, may seem quite compact at first glance, but it is surprisingly comfortable when worn on a hike. The traction sole is built for durability and will last for many hiking expeditions. You won’t notice significant wear & tear on these anytime soon. The D-ring lacing construction ensures easy sliding in; you can always fasten them a bit looser or tighter, whenever you feel the need to. KEEN really does offer some amazing hiking boots for women at affordable prices and the Targhee II is one such example. It features a leather make, a rubber sole, a 1.5″ heel, a 4.5″ arch, a protective toe cap and a waterproof membrane that contributes greatly to the boot’s breathability. Combining hydrophobic mesh with nubuck leather is one great way to ensure breathable comfort. The multidirectional lugs ensure undisputed stability. It also includes a heel lock to prevent any unanticipated jolts, so it protects your ligaments from unnecessary strain. This is especially handy if you are suffering from plantar fasciitis. Another useful feature is the KEEN dry technology that keeps your feet dry, even when crossing a river. Ahnu Sugarpine is most definitely one of the best women’s hiking boots you will find in the market. At first glance, you can clearly see the feminine touch & feel of its design. Made of leather and textile, but featuring an non-marking rubber sole. They have a 1″ heel, a 5.75″ arch and a simple and secure lacing vamp. The burgundy color is quite attractive and ideal if you want to look good hikin’. There are various other colors to choose from, all of which are very ladylike. It has a cushy feel to it, with a padded collar and tongue, and a pull-on loop to help you quickly and snugly fit in there. It is built with Numentum technology that offers stride stability and maximum ground grip. For women who love hiking and standing tall next to their masculine counterparts, these boots are one of the best choices to make. Montara has a 5″ shaft and a 1.25″ heel. The sole is synthetic. It has a padded collar, featuring eVent technology, which integrates breathability into the boot. Other features include the waterproof upper section and the rubber toe cap protector. Like other top rated boots from Ahnu, Montara features the pioneering Numentum Technology, that adds a great deal of stability. This makes this boot a great pick for women who are more interested in trails than they are in treadmills. This vibrant technology ensures your feet remain centered and aligned, allowing for the feet’s natural biomechanics to work as they are intended to. It is simple, yet versatile and suitable for different outdoor activities, such as biking or camping. As one of the most reviewed women’s hiking boots, the Columbia’s Newton Ridge offers just about everything you could possibly desire. They are not only some of the most affordable boots that offer good value for the money, but they also posess a number of enviable features! These boots are made of leather and synthetic, but have a rubber sole. They have a full-grain waterproof leather upper and a compression molded EVA foot bed, that offers unparalleled comfort. This Columbia boot features the Omnishield technology, which makes it stain and water resistant. The great Omnigrip lug pattern will give a girl great traction, no matter where she sets foot. This 5.25″ shafted boot has a triangle D-ring lacing system. The breathable mesh gives you really good ventilation on the inside. This women’s version of Timberland’s White Ledge boots comes with all the desirable characteristics that are also built into the men’s design, albeit optimized for female hikers. These boots feature a rubber sole, a 4.5″ shaft, a really solid, speedy lacing system and they have really good moisture transfer as well. Other features include the padded collar and tongue, the waterproof upper section and the Timberland logo at the side. It’s the logo that completes the picture, don’t you think? For an affordable price, you get a reliable, comfortable, long-lasting, durable hiking boot for all your hikes, camping and trailing escapades. The tongue is fully gusseted and a removable dual-mold EVA foot bed ensures that you will get total comfort all throughout even the most rugged trails. Trailers and hikers who want to incorporate style into their appearance, will find Merrel’s Moab Mild hiking boots a perfect option for their needs. These do not only offer a very aesthetically pleasing design, but are also rich in features. They are made of leather and fabric and have a Vibram sole. They have an aggressive lug design and mesh panels all over for increased ventilation. These grey and periwinkle colored ankle-length boots have some pretty nifty tech built into them. They feature Merrel’s trademark M select dry technology, which prevents moisture from permeating the boot. They also have protective toe caps. With no lugs added to the arch section, your feet can move naturally, despite being heavily supported. The Ariat Terrain H2O hiking boots are much simpler than most others in this list. Yet they offer incredible comfort and support, something that you will appreciate if you are suffering from plantar fasciitis. They have been made with Duratread sole technology. Their shaft is 5″ from the arch. They have an Advanced Torque Stability (ATS) composite forked shank in the footbed, which provides increased comfort and stability. They offer top durability and will help any woman conquer one mile after another, when she is hitting the trail. The Ariat Terrain boots are extremely durable, and you can tell by simply looking at the design. They are also lightweight, breathable and very comfortable, even on the most rugged terrains. They are moisture wicking and offer long-lasting traction. They come at an affordable and competitive price. If you’re looking for a sturdy hiking boot at a relatively low price, then you’re going to like this one. It combines a full grain weatherproof leather and latex material with a synthetic sole, for optimal comfort. It has a Gore-Tex membrane and sealed seams. This is going to keep the water out for sure. This goes a long way in making sure that the boot is comfortable to wear for long periods of time. Go ahead and wear this in a big ole’ downpour… it should hold up just nicely. The lacing system is really great, because it will give you a customized fit. And thanks to the padded tongue, you are sure to be standing firm and comfortably, all at the same time. The thick, rubber sole will surely last you a few hundred miles at the very least. This women’s hiking boot comes with an array of attractive features. It’s made of leather and textile and has a rubber sole. The 4″ shaft isn’t the highest shaft out there, so it’s suitable for women who want to give their ankles some range of motion. The 2″ heels and 1.25″ platform make sure you stand tall. They are waterproof, breathable, lightweight and very durable. KEEN designed the Voyageur boots for women traversing rugged terrains, which is why the sole is made of thick rubber. Like other high-end trekking boots, it features a midsole made of a soft, comfortable EVA foot bed for improved comfort and natural foot-settling position. It also has a waterproof membrane and a breathable design, to keep your feet dry along those watery trails. It is also one of the most stylish trail boots money can buy. Wearing these, you are sure to look as great as you feel on your next hike. Women’s Merrell Moab is a really attractive boot. And that’s not only because of its fabulous design, but also because of the fact that it is super durable and super comfortable. The bellows tongue, the leather/fabric make and the synthetic sole, are coming together as one to make this one super comfortable boot for sure. The bellows tongue especially does a great job at keeping out the debris that might otherwise interfere with your adventures on the trail. Everybody wants to stay nice and dry during their hike. These boots are sure to stay dry through normal hikes (not puddles). They will always smell pine fresh, thanks to the M select fresh technology. They are sturdily built. But thanks to their good padding, they will also be really comfortable at the same time. The lacing system is top notch, too. You won’t find any metal eyelids or hooks on here, so there’s nothing that will ever pop off. Some of my older content from 2014, included in this page for posterity! These boots are also reviewed higher up on this page. There’s a big number of boot brands out there, all trying to trump each other when it comes to the quality of their merchandise. But right now, I’d like you to have a look at these trailing boots from Timberland. Because this company really knows how to outperform the competition with their excellent taste in design, as well as the build quality of the shoes and boots that they are putting out on the market these days. These are some really top rated boots right here, so hold onto your butts! When it comes to boots, there is nothing better than the feel or real leather. No material is quite like it. Sure, rubber boots are nice… but leather ones? Ten times as awesome! And these Chocorua boots are easily the best trailing boots that have been put out there in a long time. They are especially designed for backpacking. If you’re looking for good shoes for hiking, then you need to look no further. These babies are very breathable and very waterproof. They have been made with Gore-Tex technology. And if you’ve been paying attention in the past few decades, you know that’s good news! Gore-Tex was named after its inventor, Bob Gore. This guy invented the Gore-Tex material by rapidly stretching poly-tetra-fluoro-ethylyne under specific conditions. This resulted in a super strong material that has micro pores in it. This is what we now know as Gore-Tex. It makes for very waterproof, yet breathable footwear. It’s also used in ski jackets and other clothing items, by the way. The micro pores are 20,000 times smaller than a drop of water. Yet they are 700 times larger than an oxygen molecule. So you see… water can’t get in, but air can still get out. I have used these myself and must say that these are the best trekking boots I’ve had in a long time. They look really good, for starters. But a boot is no good if it’s not functional either. These are lightweight boots, so you may not expect them to support you throughout some heavy duty backpacking activities. Rest assured that you can, in fact, rely on these boots to get you through even the longest of trails. For all the years that I have used them, they remained waterproof until the very end. Even when they started coming apart a little. The trails that I’ve gone on with these shoes, were medium ones mostly. These boots perform excellently on these types of trails. When you are going rock climbing, you will have to find something a bit more heavy duty. You can definitely feel the rocks through the shoes. It’s not that you can’t use them on hard trails… it’s more that you will wear them out quicker. They only need to last a few years, though. They’re pretty cheap and you can always get another pair of boots. And if you’re like me… you enjoy getting a new pair once every few years. Hey, the hobby is more fun if you can change boots every once in a while. All you fellow campers out there probably understand me. The greatest downside about these affordable Timberland hike boots is that the insoles are a tad bit on the low quality side. You don’t get a lot of support from them. I recommend that you get a high quality pair of insoles with these shoes. This is especially true for flat footed people such as myself. I can’t walk a few miles in any kind of footwear without busting my knees. And I wasn’t planning on having knee surgery anytime soon. I’ve heard the stories and am totally not looking forward to wearing out my cartilage and my joints prematurely. All in all, I highly recommend these low priced backpacking boots by the Timberland company. I’ve owned many boots by this company and they have never let me down. Especially at this price point, you can’t really go wrong. Just keep in mind that you’ll need insoles if you’ve got flat feet. These boots simply feel right! You are such a snug fit that you won’t want to take them off once you’ve had them on. If it were up to me, I’d even wear’em to bed. I even tried to do so, but my girlfriend got pissed and wouldn’t let me. So now I have to choose between her and the Timberlands. I told her I chose her. But in reality, I’m still doubting! One of the most well known trekking boots on the market today, is the Altitude IV. As you probably suspect, it’s aimed at mountain climbers. But trust me, any shoe that is well suited for climbing a mountain, is also well suited for trekking along a trail. The reason why this is a good quality boot is because it is made of both leather as well as textile. It’s a really great mix. But the soles are made of rubber. And the soles are pretty thick, too. And they need to be. If you’re going backpacking or climbing, then you’ll submit your shoes to quite the beating. A thick sole will last a long, long time. This ensures you get top quality for the money. Hi-Tech is known for giving you bang for the buck. These comfortable hiking boots are waterproof, as you might expect for a shoe which sells for around a hundred bucks. They are seam sealed, as it is called. That means extra care has been taken to ensure that the seams will not let any water through. When a shoe, or any other piece of clothing for that matter, is not waterproof… it’s pretty much always because of the fact that the seams are letting through liquid. It’s not hard to select a waterproof material for creating a boot out of… it’s sealing the seams that’s the hard part. And Hi-Tec has mastered this art very decently. The fact that no water can ever get into them, also makes it so that they are also very durable. These trailing shoes are not going to break down on you within the first couple of years. The Altitude shoe is a rugged boot, which combines style and durability all in one. It looks rough, but it’s very lightweight. And this makes it comfortable to wear. The leather collars are padded. The leather tongue is fully gusseted. The brass hardware is rustproof. Extra rigidity is added because of the integrated steel shanks. The EVA midsoles will give you great support exactly as they are. Chances are you will not need to replace the stock insoles of these already cozy hiking shoes, unless you are an outlier and your feet require the utmost precision when it comes to insoles. If that’s you, then you’re not going to get around having to have custom insoles measured to your personal feet. For me, it wasn’t necessary. I’m amazed at how comfortable these shoes are. And I certainly can’t understand how incredibly low priced these are, when you look at the quality that you get back for it. It goes without saying that I wear these boots whenever I go out for a good trail trek. But not only are they good for use on rough terrain, you can also wear them in every day life. My feet are so flat that I can’t walk normally on them without having proper support. When I go barefoot or I am wearing shoes without proper insoles… I’m slowly busting my knees through normal daily activities such as walking downtown for groceries. That’s why I’m pretty much always wearing my Hi-Tecs nowadays. They’ve done me well on all sorts of non trekking terrains, such as wet beaches, muddy forests and last but not least… my own backyard. I also do gardening work in these. They get muddy, but the dirt washes straight off these boots. I pretty much wear them the whole day. The only reason I take them off when I’m inside the house, is because I’m the type a guy whose feet swell up at the end of the day. Sometimes, I gotta give myself a little breather. But if it were up to me, I’d be wearing these all day long. I don’t think I’ll ever change to any other type of boot than Altitudes, now that I think of it. For most people (and I’m one of those people, thankfully) these boots perform exquisitely for a long, long time. I’ve had mine for two years now and I’ve gone hundreds of miles in them already. If you’re one of the people for which the rubber soles deteriorate quickly… don’t give up on these Altitudes straight away. You may not have had an insole that’s good for you personally. Try out another pair of these boots and try them out with quality after market insoles. Good insolves won’t have to cost you more than twenty bucks. If you’re shelling out for these… might as well shell out for good insoles as well… if you feel you really need those. So What Is This Plantar Fasciitis? The relentless epidemic of morbid obesity in the US hasn’t done our feet any good. More and more people are starting to suffer from a condition known as plantar fasciitis, which is also referred to as policeman’s heel. Not too many people have heard of this condition, but believe me when I tell you this is no joke. It’s a condition you need to take serious. It’s best if you are able to prevent it completely. But that’s not always possible. If you’ve already contracted this affliction, then you must do anything you can to keep it from escalating. If there’s one thing you don’t want, it’s a nasty case of ‘plantar’ that grows worse and worse every year. If you plan on going backpacking along the trails with this condition, you’ll have to get the best hiking shoes for plantar fasciitis. At the bottom of your foot, you have a tissue band known as the plantar fascia. It connects your toes with your heels. Some activities, such as climbing rocks, can make it so that this ligament is repeatedly stretched abnormally. This will especially be the case when you are hiking on rocky paths that do not provide any cushioning effect with every step you take. A consistent, dull type of aching. A sharp jab with every step you take. No matter which type of pain you are suffering from, this condition is always tough to deal with. It can get worse when you are walking long distances. It can be made even worse when you are burdening yourself with a heavy backpack, placing even more weight on your feet than was already the case. Policeman’s heel can also cause (or accompany) heel spurs. These are tiny calcium deposits in your heels. These will cause sharp pains while walking, usually at the center of your heel and along the inner sides. How Badly Will This Affect My Quality Of Life? Pretty badly. Especially if you don’t take it serious and just let it get worse. It’s a very painful condition. Often you’ll have ‘first step’ pain in the morning. But when your feet are in this condition, you can have foot pain at any time of the day. It will drastically reduce the quality of your life. The thickening and inflammation of the plantar fascia has a number of possible causes. Most of the time, it’s never just one single cause. It’s usually a combination of causes. This is actually good news, because this means there’s a big chance you’ll be able to tackle at least one of the causes. You are significantly overweight and are therefore exerting too much pressure on your own feet. You have to stand up straight for many hours a day. If you’ve got a job that requires lots of standing, you are at high risk. You’ve taken up a completely new type of physical exercise. Or you’ve greatly increased the intensity of an existing type of physical exercise routine. You switch from flat shoes to high heeled ones and back. A lot. Pretty much only applies to females. You suffer from other conditions. Lupus and arthritis are two afflictions known to be related. Your feet are either very flat, or have a very high arch. The golden mean is best, but people at the extreme ends of the spectrum are at higher risk. Your current shoes are worn out and do not provide proper support. Your soles are thin and your arches are suffering badly. Your heel cords, also known as the achilles tendons, are very tight. Your legs are of uneven lengths. Ofcourse, if you are a hiker, you stand an increased chance of developing this condition. For hikers, it is of the utmost importance that they wear the best plantar fasciitis hiking boots you can find. Make sure to go for boots that give you plenty of support. You have to have boots that have just the right amount of flexibility. They shouldn’t flex too much, because if they did… you might as well not be wearing footwear at all. Walking barefoot is no good for PF. Your boots are there to take some strain of your feet. But the midsole should still flex a little bit, though. If they didn’t… you might as well be wearing wooden boards under your feet. Footwear always needs to bend along naturally with the natural motion of your feet, just a little bit. The rolling motion of your foot must be supported by your hiking boots and not be made harder. You also need a good heel cup, as policeman’s heel pain is usually located in the (ayup, you guessed it) heel. Boots are great for PF, since they are inherently sturdily built. A boot is unlikely to flex too much, because most of the time, they’ll have thick soles. Next to not flexing all the way backward, they also shouldn’t flex too much when you twist them sidewards. See the video elsewhere on this page for a visual explanation. What Can Be Done To Prevent Or Cure Plantar Fasciitis? If you want to learn what you can do to cure this affliction, then click the WebMD link I’ve created above. This website is about boots and I ain’t no doctor. All possible treatments for this condition are out of the scope of this website. Many things can be done to improve a severe case of this horrible condition. But in the end, it all starts with getting good policeman’s heel hiking boots. However… the prevention and/or treatment of ‘plantar’ lies partly in your footwear. There is not any single one pair of best hiking boots for plantar fasciitis. However, there are insoles which are dedicated to preventing and treating your condition. The best types of insoles for treatment, will offer you pretty darn good heel support. Because that’s what you need in order to prevent this condition, or improve on it if you already have it. Another option at your disposal is a night splint. You have to think of a night splint as some sort of exoskeleton for your foot. Like the name suggests, you wear this at night. It holds your foot at a certain angle, which prevents your plantar fascia tissue band from contracting. Instead, it just stays stretched all the time. This prevents the bands from growing thicker. So this will at least prevent the condition from getting worse. It is possible that the condition is due to hereditary causes. You can’t help it if you have very flat or high arched feet. You can help being overweight, in most cases. And if your job requires standing up straight all day, then there’s a good chance you do something about that too. Assuming you’re not suffering from an affliction that causes you to be overweight, ofcourse. Granted… you might not be able to turn your standing job into a sitting job. But it might be possible that you are willing to switch careers and get a sitting job. In this economy, I understand this isn’t possible for everybody. But you just have to outweight the advantages and the disadvantages. It’s all a matter of priorities… how bad do you want to rid yourself of your plantar fasciitis? Next to plantar, the most common foot conditions are flat feet, wide feet and narrow feet. If you suffer from any of those, be sure to visit the page I linked to. It provides you with plenty of advice on how to go about selecting a bunch of boots for trekking into the wilderness and then actually enjoy it too. Don’t feel bad when you suffer from one of these. Most people do not have perfect feet. Neither do I. My arches are too low, but my feet are of average width. It does not matter what kind of foot you have… because the same rule applies to all: you have to have snug fitting boots that give you exactly the right type of support required for your personal feet. This is especially true if you intend to do something that is very straining, such as hiking. Best of luck in selecting good shoes. I hope my guide will help you make a good choice. Leave me a comment if you appreciate my efforts! Let’s say that you’re a real bad-#ss and you want to go hiking in the winter. In that case, you might want to go beyond what normal people buy and go for a sturdy pair of winter hiking boots. Remember… hiking is already hard enough as it is. But when you are going to do it in the winter and you are purposely selecting a snowy trail, then you are in for the challenge of your life. When traversing smooth, icy paths and maybe even steep climbs, you are going to need some solid grip power. And your boots had better be waterproof as well. If you skimp on the boots when you’re going trekking in the cold season, you are going to have an extraordinarily bad time. So make that investment and use my buying guide in order to get the best ones. You are going to need them. Do not underestimate the harsh conditions that mother nature will subject you to in case you are going to where it’s slippery and smooth. When you are going trekking on long trails, you run the risk of not meeting anybody in many miles and many hours. You may even want to consider bringing along a spare pair of boots. If your boots break in a snowy area, you can easily lose your toes to frostbite. You have been warned. Now quickly, go and ready my winter boot guide! If you’ve ever been on a hike, then you know how incredibly straining it can be on you. But not just on you, also on your feet, your muscles and especially… your ankles. Have you ever made a misstep on a rock somewhere? It hurts when your ankles twist, doesn’t it? The ankles have a great range of motion, but their flexibility is not limitless. If you are wearing shoes or boots that do not give you proper support for your ankles (which are arguably the most important joints in a hiker’s body), then you are running the risk of severe injury. You do not want to become so severely injured that you will be unable to hike for the coming months. An ankle injury can happen to even the most seasoned hiker. Don’t think for one second that this can not happen to you. If you do not take it seriously, chances of it happening to you will only increase. And an injury to an ankle (or worse, both) is not only going to keep you from hiking… it will keep you from living a normal life. Normal walking (as opposed to trekking) any distance with an injury to the ankle is going to be really hard. Whether you are merely trying to prevent this or you are trying to cure an existing injury… you would do well to get ankle support boots, both for every day life as well as for your hiking adventures. Sure, they will cost you. But will you be glad you made the investment when you make that misstep and your ankle didn’t twist. Are you one of those people that really likes to push him/her self to the absolute limits? You are not alone! I know exactly how you feel. But hey… take it from someone who’s been there. I’ve done hiking, mountaineering and climbing in very low temperatures. It’s no fun if you are not properly dressed. You are going to need the best of the best insulation that money can buy if you are to stand a chance in these merciless temperatures. You have got to make sure that you dress well from the bottom up, or you will regret it. Trust me, man… take it from a pro. I’ve made the mistake of sleeping in lightweight tents and standard sleeping bags. I’ve made the mistake of not getting myself dressed up in a good pair of down booties. I thought I was bad enough to make it through the night for a whole week. Boy, was I wrong. Without proper insulation to keep the body heat in and mother nature’s harsh cold out, you will need really good insulation. Goose down is one of the best kinds of protection a person can have. But not all down boots are alike, so make sure to compare a few before you go ahead and invest your hard earned cash. Hiking in the winter can be a pretty grand experience, but you will likely not do it again if your first time turns into a freezing nightmare. If you want to go and take a hike, and you just so happen to have a bunch of work boots lying around, you might as well use those to take along on your hiking adventure. I have done this myself in the past many times over. And I know plenty of other people who have also done it. There is no sense in buying a second pair of safety shoes when you already have a solid pair of steel toes lying around somewhere. Also, if you don’t happen to have any kind of rugged footwear and you are planning on taking either a hike or performing outdoor work in harsh conditions, then you can totally buy a single pair of shoes that will fit the criteria for both situations. 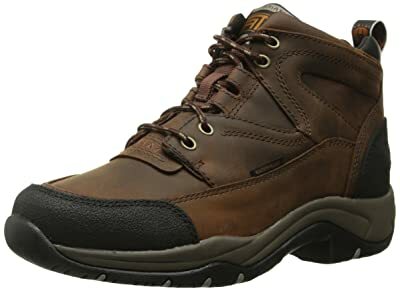 If you want to find the best work boots for you and your personal working or hiking conditions, click the link I provided earlier in this sentence and read my guideline for buying the best ones. There are plenty of rugged boots to choose from. There is something to go around for everybody. It can be hard to choose and find the best ones for you. But it is definitely doable. Especially if you read my guide. Depending on your personal conditions, you are going to need boots with a certain level of insulation, water resistance, traction, etc. It all depends on what you are going to use the boots for. Do you work with chemicals? Get steel toes! Do you work with electricity? Get double insulation! Do you work on slippery floors? Get rubber soles with lots of traction! Do you work in the snow? Get high cut boots with liners for keeping the snow out from above! You see, there is something to go around for every single activity. The more protection you need, the heavier the boots will be. The heavier your boots will be, the more stiff they are also likely to be. This may sound uncomfortable. But if your working or hiking conditions are particularly harsh, then you will simply require this level of protection. Don’t worry though, even the toughest of the toughest leather boots can be broken in with sufficient patience. As much fun as hiking is, you can’t always be hiking. The reality of the situation is that the largest portions of our lives are spent walking and standing up straight. Some people even go jogging and running. Hey, to each his own, I always say! I’ve done some jogging myself back in the day. It sure is a good feeling, isn’t it? Except ofcourse, when you are suffering from an inflamed plantar fascia. That pretty much takes the fun completely out of the experience… and even out of your life. Don’t you just hate that sharp, stinging pain you get in your feet right after you get up out of bed? It truly is a horrible experience! And for that reason, you need to get the best New Balance plantar fasciitis shoes for your own, personal situation.Whether you are a young guy wanting to go on a long run, or a grown woman simply looking for a nice pair of sandals. Everybody can suffer from this painful foot problem. It’s important that you tackle it straight away, or it will spoil your whole life. It all begins with good support for your feet, people. Take care of those heels if you want your heels to take care of you. There are great shoes for either regular walking, jogging or running. Everybody should have shoes that have great shock absorption and cushioning. The earlier you start by taking care of your feet, the better off you are. As tempting as it is to spend a whole life comfortably sitting down, I’m sure you’ll want to be standing up and walking too every once in a while. Your feet, ankles, knees and legs will have to last a lifetime. And if they don’t, you’ll basically be handicapped. Be smart and make that investment in good shoes. Your lowly feet might very well be the most important part of your body. And you won’t realize it until you’ve busted them by wearing shoddy footwear! If you are dead serious about your foot health, then you will need to get the best boots out there. Military boots are a great option if you want to be standing comfortably in your boots for years on end, even when using them intensively. They are made of the highest quality materials, specifically designed with extremely harsh environments in mind. These are the kinds of boots that soldiers use in military operations. These guys are sometimes stuck behind enemy lines for weeks or months, all the while surviving in jungles, deserts, mountains and whatnot. If tactical footwear is good enough for soldiers, surely it will be good enough for you? It does not matter whether you go hunting, skiing, backpacking, camping, trekking, trailing, climbing, hiking or whichever outdoor adventure has your personal preference. With tacticals, there is no way you can ever go wrong. They might cost you a pretty penny, but I can honestly say that they are the best investment that you will ever make. Pay once, enjoy for years. Tactical footwear will last you at least 5 years, but often they will last for more than 10. Especially if you take good care of them. The easiest way of dealing with an inflamed plantar fascia, is by preventing one in the first place. You’d think that tactical footwear would not be very comfortable just from looking at it. But the outside doesn’t say anything about the inside. It turns out that this type of footwear is actually very comfortable indeed. And when you think about it… it just makes sense. Soldiers need to be wearing these boots all day long. Don’t you think they’ve got a rough enough life as it is? If anything, they could definitely use a lot of comfort when walking. And with the long lifespan that comes with these types of boots, they kind of have to be comfortable. Because how will you endure them for all those years in a row? Hikers are not the only people that need to take care of their feet health. Think about all those people that are performing physical labor, such as store clerks, bakers, barbers, police men and women, construction workers and the like. For those of us who have a cushy office job, it’s easy to forget that most people have to spend considerable time standing straight up. It’s a great way of developing a very painful inflammation of the fascia tendon, which runs across the entire length of your foot. You will have to get the best working boots for plantar fasciitis that you are able to find online. If you are ever going to invest in yourself, then please let it be an investment in your footwear. Because if you ever develop a chronic foot condition, then you will have the rest of your life to complain about it. And it all could have been prevented so easily if only you had spent that one or two hundred bucks on a decent pair of shoes / boots. More often than not, a person who has this condition is a tad bit on the heavy side (yeah, I’m trying to say this as delicate as I possibly can). But it’s not just overweight people who develop this condition. It also happens to people who stand up straight for most of the day. Whether you are applying weight or time to your feet… eventually, your feet will have had enough. Too much strain all at once, or over a longer period of time, and your fascia tendon will start to get agitated and it will let you know every single time you get up out of bed in the morning. And once you have this condition, it only grows worse. This is because, when you first notice it, you have developed it because your current situation sets you up for it. So if you change nothing, it’s only going to get worse. And that is why it is so essential that you instantly take action in order to prevent further exacerbation of the problem. You don’t want to let this get worse until you require surgery. Trust me, you really don’t. It’s easily preventable. So buy them boots! What Are The Greatest Trekking Boots For Rocky Terrains Such As Zion National Park, Yellowstone, Yosemite And Grand Canyon? Whether you are only a newcomer to the sport, or you are a seasoned veteran… even a non hiker knows how incredibly gorgeous the above locations are. If you live in the USA, you can simply not afford to miss out on the beautiful scenery that these trails have to offer. However, you are going to need the best backpacking boots for all these geographical locations that you can find, because most parts of most of these trails will be very rocky indeed. If you are not used to rough terrain when taking a walk, then you are going to be in for something new, alright. You’ve probably seen the photographs from other people’s hikes… they were probably using hike sticks. It may look a little silly to a newcomer who has never done anything like this. But let me tell you… those hike sticks can definitely come in handy. Rocky terrain can sometimes go on for miles and miles, and it helps to have something to support yourself on. A newbie hiker on a rough terrain that goeson for miles, is going to find out what it’s like being a 90 year old with a fragile hip and walking on ice. You are going to need all the support you can get. So that means hiking sticks. But also boots. Yes… always boots. Because you’re at the Boot Bomb, gosh darnit, and I’m obessed with boots in case you hadn’t figured it out yet! Boots are the most essential piece of equipment that you will ever need when going on a hike. Especially if you are planning on going to rough trails such as the Appalachian, Nepal, Kilimanjaro, Colorado, Kalalau, John Muir, or Kalalau. Make sure to pick your trail wisely and don’t overdo it the first time. But whether you have 10 days or 10 years of experience in hiking, you are going to need really great boots. What To Do When You Want To Go On A Hike And You’ve Got Kids? Well, you’re simply going to have to take them with you. Just because your kids want nothing else but sit there and play their video games and chat with their friends on their smartphones and whatnot, it doesn’t mean that you’re going to have to let them. Kids these days are sitting around the house too much. They need to get out more. But they won’t do it all on their own. You will have to motivate them. For that reason, it would be a good idea for you to start influencing their tiny little minds at a very early age. If you don’t teach them to go outdoors before 12, then they are unlikely to ever move off the couch. They’d rather be multiplayering whichever game is popular at the moment with their headphones on. Hiking is one of the best ways of getting your children into some outdoor adventures at an early age. You’re going to need hiking boots for kids that will give them all the support and safety they require for those tiny little toes of theirs. Kids are still developing. The younger your kid is, the more likely he or she is to be growing like cabbage. That’s one thing kids are good at. Growing. If you’re out of luck, they’ll grow so fast that you can be buying him or her a new pair of boots every year or so. Ha ha. Be sure to hang on to those boots that your eldest has outgrown and pass those right on down to the kid below him, provided there is one ofcourse. If there are no younger kids to pass the boots onto, then (provided they are still in good shape), you can sell them for 1/3d of their original value and you’ll regain at least a part of your investment. Whatever it takes to get those kids outdoors, boys and girls. Hikers aren’t the only ones to suffer from this dreaded chronic heel pain condition. It can happen to the best of us. Besides, hiking isn’t the only sport that requires a person to stand and move around on his or her feet all the time. I have friends who like taking walks, who like going for a jog, or who like going for a long distance run. There are also people that play tennis and other kinds of sports where you need to be moving around quickly all the time. Do not underestimate the pressure that your feet are exposed to when you are getting all physically active like this. It’s no wonder that some people develop policeman’s heel. And if you want to keep doing what you love, then you better get your hands on the best shoes for plantar fasciitis that you can find. More often than not, it’s overweight people that are suffering from this dreaded condition, and they want to do something about it. I applaud them. But their weight is not only the cause of their foot health problem, it is also preventing them from getting a move on and fixing that problem. Especially for overweight people, it is essential that you get footwear that provides you all the support you need. Your heels are what keep you standing all day long. If you do not get shoes with a good heel cup, then you are going to be exerting more pressure than necessary onto your heels all day long. Your shoes must also have a midsole that flexes a little bit, but not too much. You have to relieve your soles of the shock that they take when taking a step, while at the same time still letting your feet make their natural motions. The right amount of flexibility and good heel cups is what it’s all about, if you want to stand a chance at curing your policeman’s heel. The last time I edited this particular page, was quite some time ago. I have made a new top 20 best men’s hiking boot guide for 2019, which features all the best boots from all the best brands, sorted by popularity from top to bottom, especially for your convenience. Whoah, that was a mouthful! If I told you that I’d been working on this for hours and hours, I’d be lying. The truth of the matter is, I have worked on it for days and days. Because that’s just how much I love good footwear. And my readers, ofcourse! It’s 20 different boots from 20 different brands. This is the end-all boot buying guide right here. Check it out! Oh, and there’s a top 20 women’s hiking boots page as well! 4 So What Is This Plantar Fasciitis? 6 How Badly Will This Affect My Quality Of Life? 7 What Causes Policeman’s Heel? 8 What Can Be Done To Prevent Or Cure Plantar Fasciitis? 10 What Are My Other Options? Very informative. Been in a lot of pain for 5 months now and looking for help to choose suitable footwear. Thank you. Thanks for the compliment. And you’re welcome! Thank you for such a comprehensive report!!! I’m a nurse and an outdoor-loving mom of ten. Not overweight but have struggled with this pain on and off for years. Heading to the GC in Az with our eldest next month. Searching for something I can wear and not ruin our trip. I will be checking all these shoes out. After I read your article, I decided to buy the Keen Targhee II boot that you suggest, I don’t know if I am in bad luck, but after 3 hours wearing them, I start to feel in both outside foot an unbearable pain, so much that I need to take a taxi at home. It has been the worst experience in my life. Sorry to hear you had a bad experience. It happens sometimes. Have you broken them in properly before taking your hike? A boot really shouldn’t hurt quite that bad, especially not if it’s broken in. Let me know if I can help you out somehow. Very helpful article. I had previously purchased a pair of Timberland PROs off the Internet. I like the Timberland brand, but because I could not purchase them locally, I decided on the Keen Men’s Targhee. I have had a couple of Keen shoes before and love how they feel and wear. I am sitting around the house, letting them form to my feet before we go for a walk tomorrow. Thanks for your guidance and advice. Thanks for your feedback, D! How’d the walk go with your Targhees? I’ve been looking for a comfortable hiking boots, and I see Keen Targhee has a shaft measurement approximately 4.5″ from arch, while the Ahna Sugarpine has a shaft measurement approximately 5.75″ from arch. With an inch & a quarter difference, I would think one would surely fit better that the other. Can you please explain what this measurement is? Thank you, I have found this article very helpful in narrowing down the hiking shoes I want from ten, down to three! The higher the shaft, as measured from your arch, the higher the boot is. Higher boots give better ankle protection, but might also cost you some flexibility. It’s a trade-off. Choose wisely! Very helpful thank you very much. Which ones did you end up choosing? Going on a trip to South Africa. I have plantar fasciitis in the left foot, hallux limitus in the right. Any suggestions for good walking/ hiking shoes that might work for both problems?? For hallux limitus, you probably want a wide toe box, am I right? You may want to have a look at my page with hiking boots for wide feet. I have a number of wide hikers for women on there. Let me know if this helps. If not, then feel free to drop me another comment. The Merrell Moab is not good for plantar’s fasciitis. I loved the sneaker and bootie version and ended up having to give them away. I tried buying new ones (older ones weren’t even a year old) and no go….the PF got worse. Went to New Balance (any one with number over 500) and the PF went away. So, I hauled out the booties I still had and within two weeks, the pain was returning. Same custom insoles in all I wore. Sorry to hear the Merrells didn’t work for you to help you get rid of your PF. There’s a good shoe to be found for everyone, and you found one in New Balance. I’m glad you managed to solve the problem in the end! I am surprised that you didn’t mention custom orthotics. They were the thing that finally lessened by PF. Yes, they are expensive but they last for years and I feel they have kept my pf from getting worse and I now have only occasional pain. Then switching to Hoke One One shoes has done the rest. I just have to make sure I don’t stand straight for very long at a time. now, and rarely have pain, and I could barely walk at one point 10 years ago. Actually, I refer to custom insoles on plenty of pages all over Boot Bomb. Although I don’t recall exactly which ones, because I’ve written so much content over the years! I’ve had PF myself many years back. I understand the importance of good footwear and good insoles. I wear Tread Labs myself. They work fantastically well for me. I’m glad your Hoka One Ones and your custom insoles have allowed you to stand and walk comfortably.